That Live Action ‘Teenage Mutant Ninja Turtle’ Reboot is Finally Happening!!! Jonathan Liebesman (Battle L.A./Wrath of the Titans) is set to direct a reboot in live action form of the ‘Teenage Mutant Ninja Turtles’ for Paramount. I’m seriously, people in Hollywood fail upwards. Liebesman started with ‘Darkness Falls’ then went on to ‘Texas Chainsaw Massacre: The Beginning’, then to ‘Battle L.A., and then onto the upcoming sequel to ‘Clash of the Titans’. How does someone like that get more work? 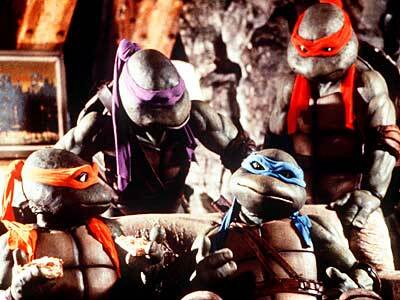 Paramount has been wanting to do a TMNT project for a few years now, but nothing has gotten off the ground yet. Michael Bay and his Platinum Dunes company will produce the film with Scott Mednick and Galen Walker, who produced the 2007 TMNT film also. Josh Appelbaum and Andre Nemec have written the script for the film. They wrote the recent ‘Mission Impossible’ 4 film. I definitely do not have any hope for this film. Hopefully I will be surprised. At one point, Paramount wanted Brett Ratner to helm the franchise, but that fell through. Ratner is also a poor choice. All I can hope for is that they get Corey Feldman back as the voice for Donatello. This entry was posted on Wednesday, February 15th, 2012 at 12:53 pm	and is filed under Film, News. You can follow any responses to this entry through the RSS 2.0 feed. You can skip to the end and leave a response. Pinging is currently not allowed. « Bonaroo 2012 Lineup Announced!! !